A new VR attraction invites users to strap into a haptic vest, grab a VR gun, and embark on a real-world indoor adventure as an undercover stormtrooper from the Star Wars movies. Complete with props, smells, sound effects, and weather, the experience is called “hyper reality” and it looks awesome. 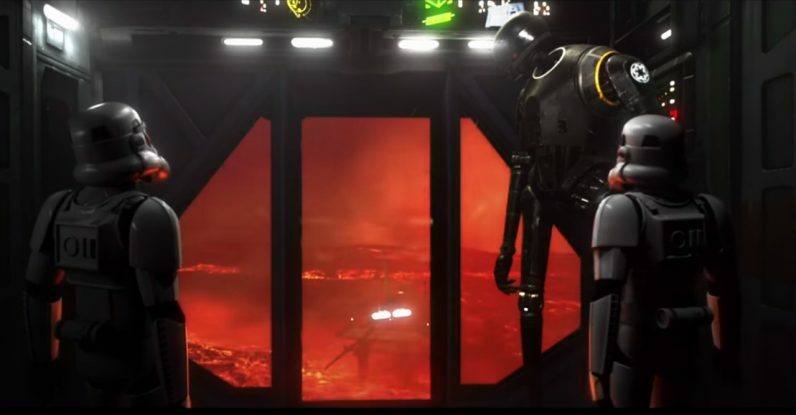 Developers at The VOID created the immersive experience using the popular Unreal Engine 4, which also powers games like Fortnite: Battle Royale and movies like Finding Dory and Star Wars: Rogue One (yes, that’s the real K-2SO you see in the footage for Secrets of the Empire). The Unreal team got to work with Lucasfilm and ILM on Rogue One: A Star Wars Story, and we were able to take advantage of some of the work that was done for that movie. The adventure takes place on the planet of Mustafar, which fans will remember as the place Obi Wan Kenobi turned Anakin Skywalker into barbecued Sith. However, in order to get there, you have to travel to the far away exotic lands of Orlando, Anaheim, or London – it’s not available anywhere else. Once strapped into all their gear, players walk through the mission tetherless – they wear a backpack that carries a computer to power the headset – and work together to, presumably, uncover some imperial secrets and shoot colorful lasers at bad guys. Star Wars is a natural candidate for immersive VR due it’s bright colorful worlds and sweeping tales of adventure. But the whole thing reminds us of the holodeck from Star Trek: The Next Generation. And while the Trek device rendered physical objects that seemed to temporarily exist in the real world, and this one uses physical props in a room created for the game, the general idea is the same. You gotta start somewhere. VR games like Star Wars: Secrets of the Empire serve to provide a bridge between playing video games and living them, and they’re only going to get better. VR isn’t going to replace traditional video game experiences, but it’s definitely going to create new ones. If the future of VR involves haptic sensors that provide real-time feedback (you’ve been shot!) while you run around sweating and fighting enemies only you and your friends can see: count us in.